Watch the video recording of this episode here. We have a very exciting episode this week, as we are joined by our third guest host in the history of the podcast. I’m talking about Andrew O’Brien, whom I have unofficially dubbed “Mr. Media Man,” and who can be found online at www.patefactus.com. 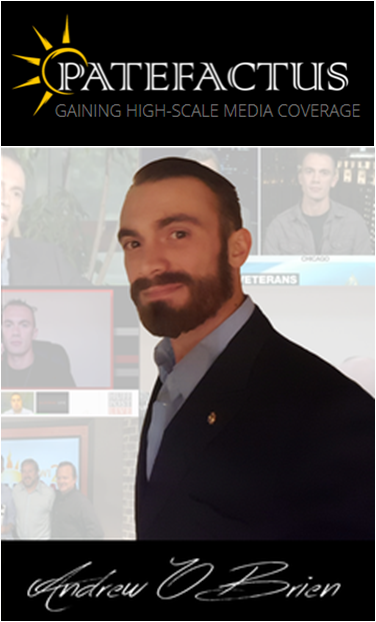 Andrew has been a public speaker for the past three years, and during that time he has been featured on over 70 media channels around the world, including but not limited to MSNBC, USA Today, MTV, and Al Jazeera. He has developed and perfected a new method for acquiring media exposure that won’t cost you $2,500 per month to hire a PR firm. More than just helping people get media coverage, he teaches them how to leverage that exposure to build an international brand and increase audience size and conversion rates. The main way I know I’m doing good work with my business is when I’m doing something that is completely out of my comfort zone, and I would put getting media coverage with MSNBC, for example, in that category. That’s how I know this is an important conversation for us to have on the podcast. Andrew even spoke at the White House a few weeks ago! Carter and I are naturally honored to have him on the show, as that’s a very tough venue to follow. To begin, we’ll assume our listeners have never thought before about getting media coverage. What is Andrew’s first step for achieving this goal? Andrew says the biggest mistake most people make when it comes to media exposure is they don’t think they deserve it. This seems to be especially true for people working in the tech industry (that’s us!). The reality is any entrepreneur, no matter their industry, can use media exposure to build their business. You just have to know how to sell yourself. If you’re in the tech industry, for example, you’re probably doing something different than your competitors. What you need to do is hone in on that message of how you are unique and how you can benefit people by bringing something new to the table. Realize the worth you offer to the world, even if it’s in a specific niche. Andrew can’t emphasize this point enough. Something you’re doing has worth, and once you get that media exposure, you’ll be bringing yourself in front of a brand new, unattached market. Getting media exposure doesn’t even cost you any money. It’s free advertising! Of course you will be nervous the first time you appear on a media outlet. You always start with small stations or publications and work your way up to the bigger ones. Practice is key, and interviewing with the smaller studios gets you that practice. The first news station Andrew got on was the local Fox News station in Austin, Texas. He was unprepared for how uncomfortable it is to have a big video camera in your face that you aren’t supposed to look at, and it probably showed in the interview. But what doesn’t kill you makes you stronger, and look how far he has come. If he can do it, so can you. So, once you start believing you have something valuable to offer the media, what do you do next? The answer is pretty simple: you start sending out feelers to find people who would be interested to have you on their show. Everyone is podcasting and blogging these days, so those are the easiest outlets to get on. Post messages in social media groups telling people who you are, what you’re doing, and why you’re doing it; then ask if anyone has an audience they think would benefit from your value. It’s important that you sell yourself more than you sell your service. Tell everyone why you do what you do, and describe the passion behind it. Every entrepreneur has a certain passion that explains why they are an entrepreneur. They want to make a difference and change something for the better. You need to hone in on this message of “why,” not “how,” because that’s the message people will connect with. This approach makes sense for getting onto blogs and podcasts, but what about the news media? How did Andrew get his first interview on Fox News? The answer: Andrew has been a trauma speaker for the past several years, and he made a 5-minute YouTube video into which he poured all his passion for his work. He explained his “why” and mentioned a book he had recently written, and then he sent the video to every local media station he could think of. Fox News Austin was the first one to respond. But on the very same day, the local newspaper Austin American Statesman also responded to his video. In a 10-hour long interview that spanned the course of two days, Andrew shared his story with the reporter, who captured the story so well that it got picked up by the Associated Press and went viral around the world. Andrew credits this reporter’s dedication and the effort he put into the article as the reason his career took off. It was his big break. As long as you keep putting yourself out there, you will eventually have your big break, too. Mine came when Lifehacker featured my Java programming blog on their front page, leading to huge increases in my traffic. However, it’s important to note that getting media exposure just once isn’t going to do you much good. What you really need is repeated exposure, because that’s what will convince an audience to take interest in you. Finally, you also need to never get “too big for your britches.” Even though he has achieved widespread exposure on international media, Andrew still never says no to a podcast or blog interview. He puts in the time for every interview because getting media exposure is scaling your business, and you never know who will be in your audience. Andrew is a pro at garnering media exposure, and as such, he has developed a specific strategy and toolset for the purpose. First and foremost, he has created a Media Outreach Template he uses when emailing podcasters and bloggers to ask for exposure, and you can use this template, too. All you have to do is fill in the blanks with the relevant information for the podcast or blog you are contacting. Use the template to explain who you are, what you do, and why you want to be on the show. Mention a specific episode or article you liked and explain how it affected you; this shows you are actually familiar with the podcast or blog and care about its content. Finally, offer a free gift for the audience if the host agrees to have you on the show. You have to sell the host on your value if you want to get on the show, and this will help convince them you have something good to offer. In addition to the outreach template, Andrew stresses the importance of having a media page on your website. This is the most important thing that will help you get exposure, but tons of entrepreneurs seem to forget it. The media page is a webpage that details all the outlets on which you have appeared, including links to your interviews and photos from your media visits, if you have any. The whole point is to show what you’ve done and get new media outlets excited by the prospect of having you on their show. Andrew credits his media page for getting him all his international coverage. When people searched for “trauma” in Google, his name was one of the first results, and when they viewed his website, his media page convinced them to ask for an interview. 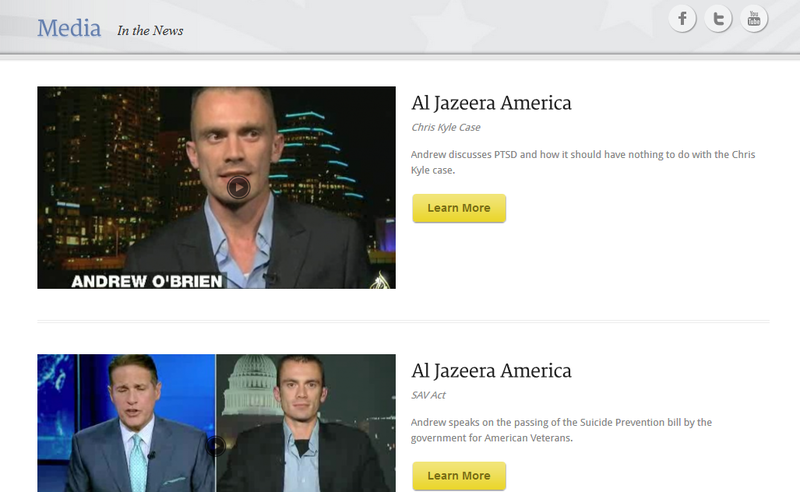 Check out one of Andrew’s media pages for his work as a trauma speaker at wyshproject.org/media (screenshot above). Andrew would like to point out that every international media outlet on which he has been a guest contacted him requesting an interview–not the other way around. Over time, he became the top competitor in his market because of all his media exposure. It turns out that acquiring all this free exposure is a powerful form of marketing. It is Andrew’s chief form of marketing, and it has brought him a lot of success. In contrast, the majority of my business comes in through content marketing, and it’s taken me three years to reach the point where I am. If I had been marketing through media coverage instead, I probably could’ve gotten to the same place I am today a lot faster. This type of marketing is not magic, though: it may be powerful, but it still requires time and dedication. In fact, the biggest pushback Andrew gets from clients is that they don’t have enough time for it. There’s nothing wrong with content marketing or any other type of marketing. It all comes down to the amount of effort you put into it. Media marketing can get you to your goal a lot faster than other types of marketing, but it also requires a lot of time and hard work. There’s a good chance that much of this work will be unpaid work. Everyone hates to do unpaid work (and content marketers are certainly no strangers to it), but the reality is it’s often necessary to get your name out there. A few years ago, Andrew spent $10,000 to rent a cheap bus and tour across America, speaking for free at nonprofit organizations. He earned no income except for the copies of his book he was able to sell, but every time he went to a new city, he reached out to the local media, and every city he went to, he got coverage on two or three news stations or newspapers. So, he spent $10,000 and held speaking engagements for free, but he got tons of free media exposure in return. All this free work built up his portfolio, which lead to more exposure in the future. For this reason, Andrews recommends you do unpaid work if you are financially able. It will benefit you in the long run because you’ll get exposure out of it and people will begin to see you as an authority in the field. Let’s return to our steps for getting coverage on the media. What happens after you reach out and find an outlet that wants to interview you? Unfortunately, your job is not done once you have booked an interview. Getting the gig is only half the battle, just as creating your product is only the first half of the job. Selling your product is far harder, as is creating value in your interview. Remember this: your success in an interview is largely dependent upon your ability to convey your passion for your work and your authority in your field. In order to be a successful entrepreneur, you have to believe in what you do and be passionate about it. If you are passionate, this will show clearly through your interview, but you also have to be confident and project that confidence so people will want what you’re offering them. For example, Andrew tells people he is a media revolutionary. He has revolutionized the way you can use the media to your advantage, and he does something no one else has done. This claim automatically gets people interested and illustrates his authority. As much as you need to convey your passion for your work, you also need to convince the audience that you know what you’re talking about, and that they need to listen to what you have to say. Your strategy for the interview will be different depending on whether it is prerecorded or live. If the interview is prerecorded, then the interviewer will talk to you for about thirty minutes, and that footage will later be edited down to a two-minute clip. You don’t need to worry too much about prerecorded interviews, as any pauses, slip-ups and generally unflattering moments will be edited out of the final cut. As long as you know what you’re talking about and communicate it effectively, you’ll do fine. Live interviews are considerably scarier than prerecorded ones. When you’re interviewing live, you need to be prepared to answer any question that comes your way. You also have to focus on projecting confidence and authority. It’s a good idea to practice for any interview, but you should practice more for live interviews. You can even get a friend to do a practice interview with you. As a general rule of thumb, be prepared for questions about religion, politics and your competitors, and learn how to deflect them gracefully. You should always avoid sharing your personal opinion on these subjects because the interview is about your business, and business is about getting every possible market into your sales funnel. You can’t afford to offend anyone. When you land an interview with a media outlet, you should also use the exposure as leverage to drive sales within your audience. Before he shoots a live interview or before a prerecorded interview airs, Andrew posts on all his social media platforms and tells his audience members to tune in. After the show, he sends the link to his audience in case they missed it, and then he uses the Facebook advertising platform to retarget everyone who watches the interview. For one week following an interview on a podcast, blog post, or television channel, he advertises only to the audience that consumes the content via the link he provides. The ultimate goal of this retargeting is, of course, to get people to opt-in to his email list and enter his sales funnel. Before we call it a wrap for this episode, Andrew wants to reiterate the importance of getting constant media exposure. Always, always, always be looking for additional exposure. Never think you have too much on your plate. Take just one hour each week to do an interview for a podcast or blog. Get in front of an audience, because it costs you nothing but time and is the most important thing you can do for your business. And always put your best effort into every interview you do, no matter how small the audience. You never know who will see the interview and how they might affect your business in the future, and you don’t want a poor performance to set the standard. Carter and I are honored and very grateful that Andrew followed his own advice and joined us on the show this week. Neither of us knew a thing about media exposure before recording this episode, and now we’re filled with ideas for improving our businesses. We hope you are, too. If you want to get in contact with Andrew, head over to his website, www.patefactus.com. While you’re there, opt-in to his email list to receive a free webinar and his three-step guide to gaining high-scale media exposure. And don’t forget about his free Media Outreach Template! As for our podcast, keep following us week-to-week to find out what shiny new advice Carter and I have to offer, and what adventures we get into with our businesses. We like to keep things interesting around here. Thanks for listening, watching or reading, and we’ll catch you next time. Happy learning!